At BCS, we have a goal to increase our attendance, and each classroom was given the challenge to spell out the words PERFECT ATTENDANCE, adding a new letter each day that everyone is present. When both words are spelled out, classrooms are encouraged to celebrate somehow! 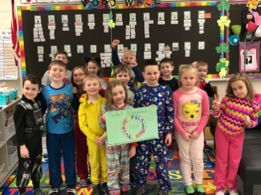 Mrs. Vincent’s first-grade class and Mrs. Holinger’s fourth-grade class were the first two classes to spell out PERFECT ATTENDANCE on the same day! We are so proud of all of these students for being here every day at school!! Let’s see which classroom will be next? !